Analog Giant: Lollapalooza Day 3. "I can't buy what I want because its free." My Morning Jacket covering "Move on Up" by Curtis Mayfield, Pearl Jam telling BP to knock their polluting of Lake Michigan off, "Daughter" accoustic. "Elderly Woman Behind the Counter In a Small Town" played. Everything about Sunday was great, it wasn't Daft Punk great, but it was one hell of a show. We made it to a suprisingly un-drunk Winehouse and then were able to stake out a nice spot between the garbage beer stage (aka the Bud Light stage) and the myspace stage allowing us to hear both My Morning Jacket, !!! and Tv On the Radio. I am a huge TVOTR fan but I felt some of their sound didn't translate to festival stage but its hard to argue with the "Wolf Like Me"-"I Was a Lover" combo. Amazing amazing day. Thanks Chicago. Regrets? Missing Iggy Pop and Lupe. Read more about Sunday at Pitchfork here and here. 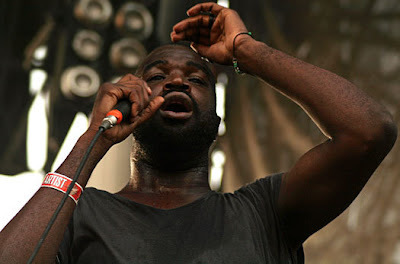 photo by Kirstie Shanley of Pitchforkmedia.